We're excited to launch the first version of our Android app! To Add gas/deals or Update gas, you must register (inside the app) with a username, email, and password. 3) Add a gas price, or update an existing one - user must be logged in first. 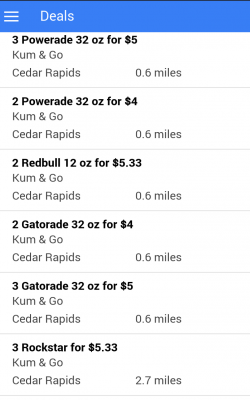 3) Gas Station locations are available, but gas prices and deals are slim to none as it is dependent on users to enter them to get the most benefit. Please contact us if you have any ideas that you would like to see in the app, or if you find any problems. Gas Stations have the ability to manage their own store(s) using our service and the web interface. This benefits gas stations by allowing them to publish gas prices and deals sooner, rather than waiting for customers to find them and enter them. Additional features include pre-scheduling a deal to activate at a certain time as well as other advanced scheduling features. Here are some screenshots of the app being used. 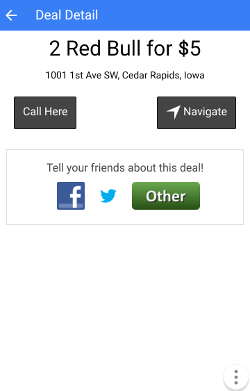 The BETA version of the mobile app is now ready for Android devices. 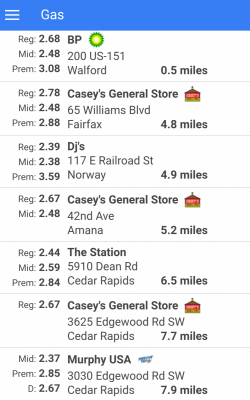 Gas Station locations are available, but gas prices and deals slim to none as it is dependent on users to enter them to get the most benefit. Please use the contact form on this website to let us know of any issues or suggestions!